Canuck Place is supported by caring donors of all ages, and every single one is an important member of the Canuck Place community. 12 year-old Spencer was inspired to get involved by his mom, who is a member of the Gift of Love Gala committee. Spencer’s entire family are active athletes, both of his parents run marathons, and Spencer had previously completed the Vancouver Sun Run and a Family Fun Run in Disneyland. 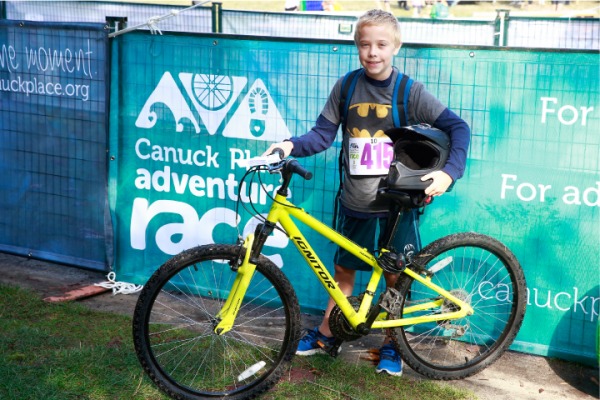 This year he decided to compete in the Canuck Place Adventure Race, his first multi-sport event. Competing in the kids course comes with a $250 goal, but Spencer raised over $1300 to support Canuck Place children and families. He went door-to-door in his neighbourhood, and sent emails to his friends and family, explaining that any amount his supporters could give would make a difference at Canuck Place. Spencer’s family was on hand to cheer him on at the Adventure Race, where his favourite leg was the obstacle course. Spencer believes it’s important for kids his age to get involved in their community. Caring is featured in 2016’s 12 Gratitudes. Follow along as we share joy and gratitude.